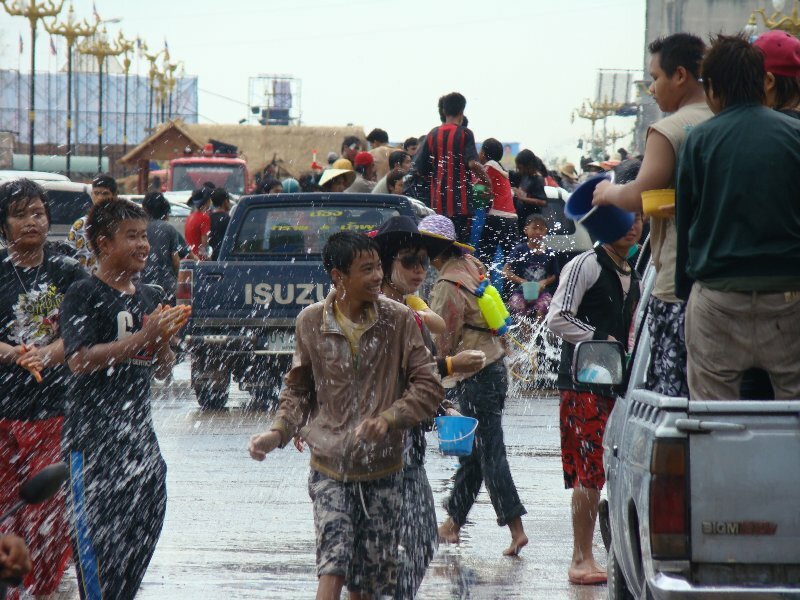 As I mentioned in an earlier post I was lucky enough to spend the Thai New Year, known as Songkran, in 4 different provinces. I spent the first day of Songkran in Pattaya on soi Diana playing with all the bar girls and the subsequent days I spent in Mukdahan, That Phanom and Nakhon Phanom. 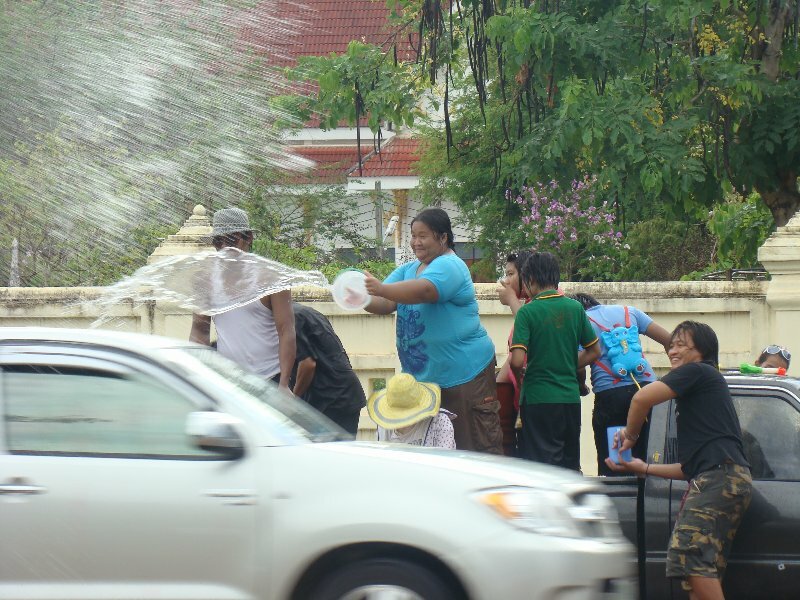 For those of you not in the know Songkran is basically the worlds largest water fight that takes place throughout the entire country of Thailand for 3 straight days ( 5 or more days in Pattaya). You’ll be assaulted with squirt guns, hoses, water sticks and bowls of water. Aside from the water you will have baby powder smeared on your cheeks and dumped on your head. Sometimes large blocks of ice are used to chill the water used and depending on where you are the water and powder may be dyed different colors as well as scented. Cold green colored water and mentholated baby powder happen to be my kryptonite! I did enjoy the jasmine scented water I ran into here and there though. 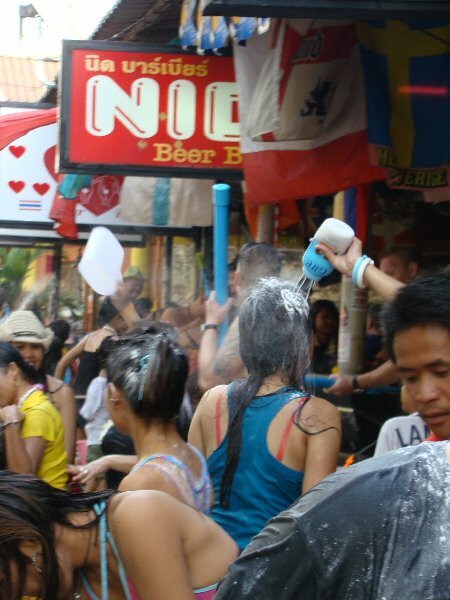 Songkran in pattaya is what you would expect, many falangs and bar girls having fun. Unfortunately I witnessed a few incidents where some falangs didn’t want to play and became irate at getting wet. 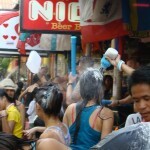 Why would you be out and about during Songkran if you didn’t want to get wet? 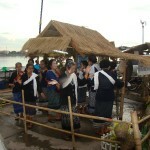 One occasion I witnessed a very old falang hit a Thai girl for squirting him. The only reason he wasn’t beaten to death on the spot was due to the fact that he is well known in the area and apparently has a mental disorder. For the most part it was a great time getting soaked and powdered. Mukdahan was quite a different story. Although it is a nice sized city most of the action took place on the side roads and on the roads leading out of the city. This of course necessitated a truck to drive around in and a few good sized barrels filled with water. When the water ran out we just stopped at someones house or a water station for a refill. 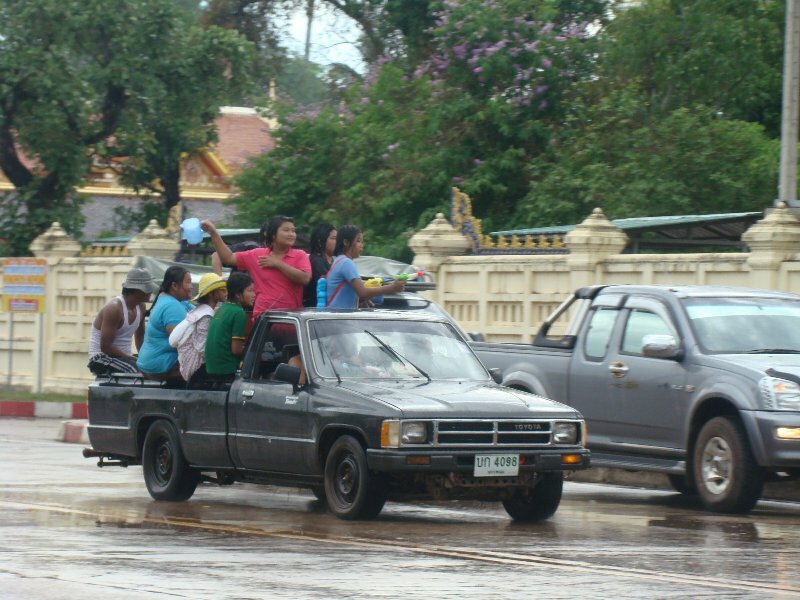 We spent 12 hours driving around throwing water between Mukdahan and That Phanom, stopping occasionally for food and water. One thing that caught my eye were the many colorful stands on the rural roads decorated in red and yellow selling some sort of clay pots. 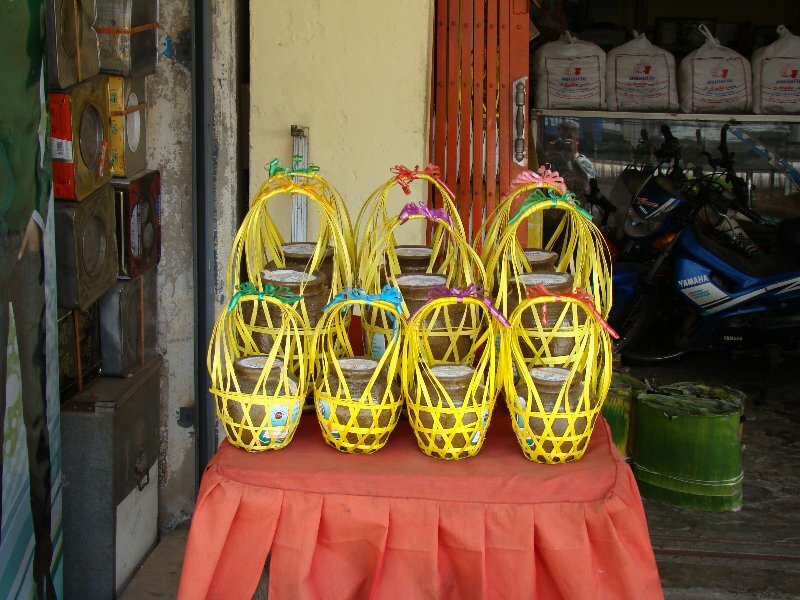 It wasn’t long before I was offered a drink from one of these clay pots that made everything very clear. It seems the Thai’s in rural Thailand make their own Thai whiskey just for Songkran and everyone and their brother sells it on the roadside. 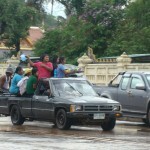 Now I know why there are so many drunk driving deaths in Issan during Songkran. I have to admit though, it was pretty good hooch. 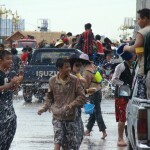 I’d have to say Nakhon Phanom won me over hands down for being the best Songkran experience. Everyone was extremely friendly and sharing everything from beer and food to their water and powder of course. I think the best part was hanging out with Pooki’s family…especially her beautiful little girl Fa. 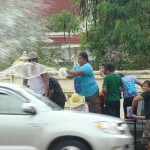 You may not like huge water fights but I think everyone should take part in Songkran at least once in their lifetime. Songkran’s a pain. 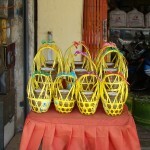 I hate Songkran and try to avoid it whenever possible. Either leaving the country or locking our family into the house. The should have designated battle zones. Best Songkrans are when it’s raining – like the rather cold rain some years ago. The streets were safe, all the trouble makers were freezing their arse off. Put me in the same camp as Dan. But each to his own. You certainly seemed to enjoy yourself and I am certainly not against that. Its just a pity that the real meaning/values of Songkarn seem to have got lost somewhere. Mikes last blog post..Thailands Groovy Dr Death. I do think it can go a bit too far in Pattaya and Bangkok but all in all if you are in the right frame of mind good fun can be had. 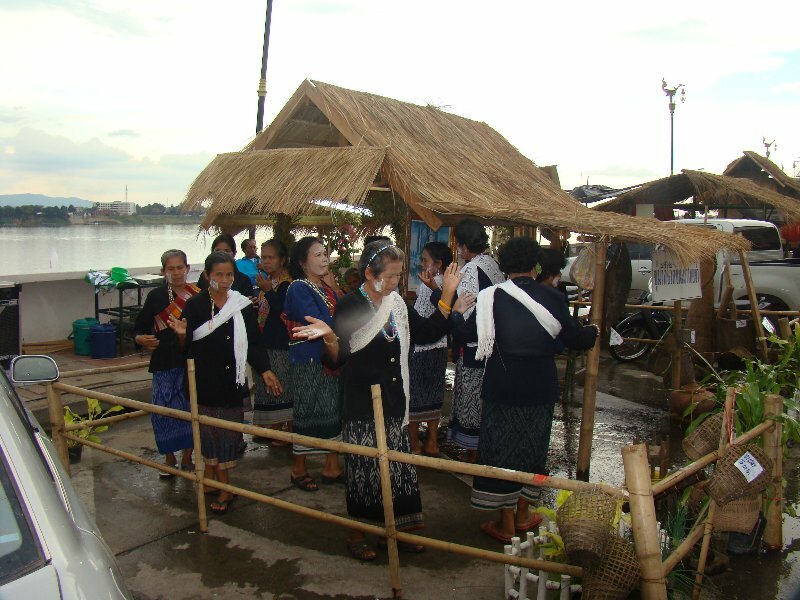 Although up in Issan it was mostly water fights there was still a lot of tradition to be had from dancing to temple visits. 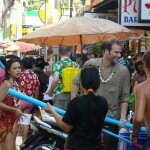 Haha – misery guts farang who are on the streets deserve to get wet, friggin hilarious. As you say, what do they expect???? Ben thats why I stay at home and don’t inflict my misery on others! 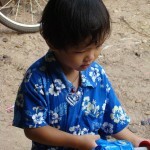 Mikes last blog post..Thai Garden:Weekly Update (7). 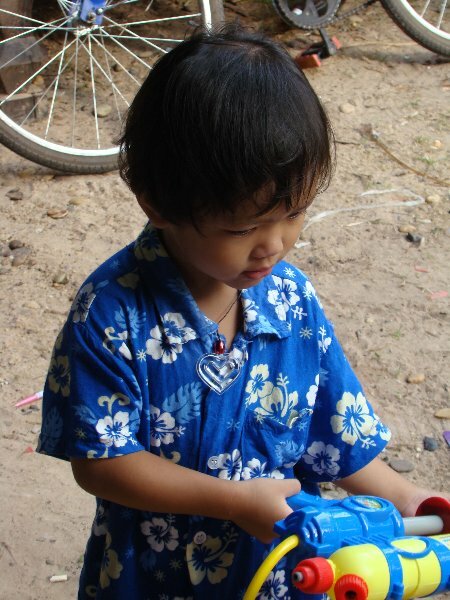 I used to snub Songkran. But after coming to Thailand since ‘94, then moving here several years back, I finally had a taste this year. Truthfully, it didn’t count as I hid with my camera behind glass. Well, except for the time when the neighbour kids announted me with powder. But not next year. Just this past week I convinced friends from the UK to fly out to join me as next year I’m getting a camera protector and I’m wading in.